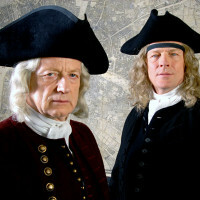 Diving deep into eighteenth-century London’s criminal underworld, through the eyes of a pair of crime-fighting brothers, this bold series follows the adventures of John and Henry Fielding, the magistrates of Westminster (the bow street runners) as they battle to establish the world’s first police force, against a rising tide of filth. With politicians sceptical about the new police force and the criminals running large parts of the city, the Fielding brothers and their team of constables have to work very hard to justify their existence. As the series progresses, the cases become increasingly challenging for the brothers, eventually leading their team of Runners into direct conflict with a powerful, ruthless and organised enemy. Justin Hardy’s engrossing 5-part series tells the crime stories (dramatized from events well documented at the time) apace and in Ian McDiarmid and Iain Glen he has two actors who give beautifully reined-in performances as characters that at this remove appear larger than life. The scripts’ subtlety and humour keep one entertained:a gem of a programme. This turns out to be an unusual, intelligent and informative period thriller, part-police detective mystery and part-docu-drama. With the long, greying hair and round, dark glasses, the principles actors Ian McDiarmid and Iain Glen come on like refugees from the reanimated Led Zeppelin in this absorbing and innovative new series. … and in Ian McDiarmid and Iain Glen he has two actors who give beautifully reined-in performances.